The graveyard was first used at the last quarter of the 17th century. Currently, 5 Dutch and 33 British graves are sited within the compound. 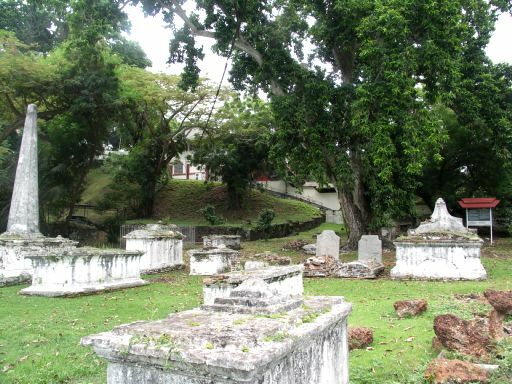 The cemetery was used in two stages that is between 1670-1682 and later between 1818-1838. The first British person to be buried here was a sea captain by the name of John Kidd, while the last was the wife of a British army officer in 1838. Most of the British buried here were naval personnel. A number of wives of army officers were also buried here. The grave that attracts the attention of most visitors is the one that has a tall column on it where two army officers were killed during the Naning War (1831-1832). This graveyard has been gazetted a National Monument under the Antiquities Act 1976.